The presidents of Europe’s three main institutions yesterday (5 May) presented a bleak picture of the European Union, saying the 28-nation bloc lacked leadership and was descending into petty, nationalist politics. “We have a lot of salesmen in the European Council and only a few statesmen,” said Martin Schulz, the president of the European Parliament, bemoaning the current crop of EU government chiefs who are struggling to overcome a string of crises. 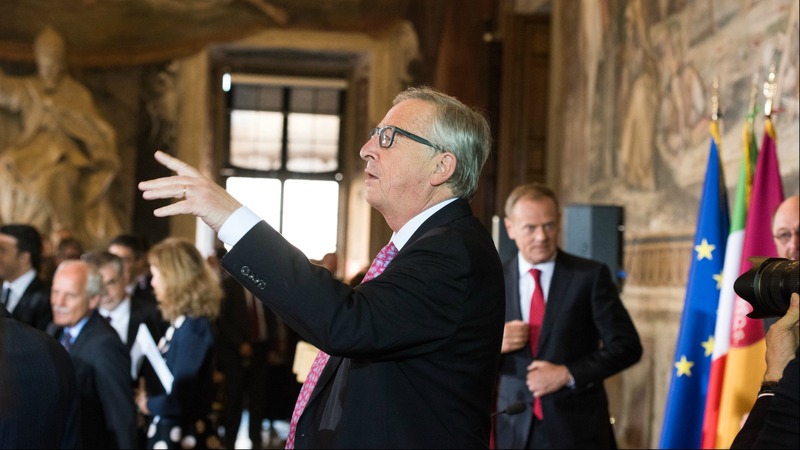 Schulz joined European Commission President Jean-Claude Juncker and EU Council President Donald Tusk for a debate on the future of Europe in the room where the Treaty of Rome was signed in 1957, which laid the foundations of today’s European Union. “The idea of one EU state, one vision … was an illusion,” said Tusk, a former Polish prime minister, who is now tasked with finding consensus and cohesion amongst EU leaders. Britain, the Union’s second biggest economy, is due to hold a referendum in June on whether to withdrawal from the bloc. Years of economic underperformance, particularly in the continent’s southern rim, have also frayed the fabric of European solidarity. “We have full-time Europeans when it comes to taking and part-time Europeans when it comes to giving,” said a particularly downbeat Juncker, adding that the “part time” Europeans were often those who received most from EU funds – a clear reference to new member states from the east. “Now we have too many part-time Europeans,” Juncker said. Without naming names, Tusk also said that the newcomers were often the most opposed to finding a common policy on the migration crisis “sometimes in a very irritating fashion”. Italy and Greece are the main ports of entry for the migrants but say they should then be sent on to other European countries to share the burden. However, Poland, the Czech Republic, Slovakia and Hungary have rejected European Commission plans to introduce mandatory quotas of refugees and have accused Brussels of trying to blackmail them. Juncker, a former Luxembourg prime minister who has been at the heart of EU policy making for three decades, reminisced about the time when Europe moved towards economic union and created the single euro currency. “In former times we were working together … we were in charge of a big piece of history. This has totally gone,” he said, complaining that EU citizens did not understand what the European Union was trying to do. 6 May: The three EU presidents will attend the Charlemagne Prize ceremony which is this year awarded to the Pope Francis and therefore exceptionally taking place in the Vatican. Commission: Remarks by President Jean-Claude Juncker at the Panel discussion on the "State of the European Union"
Junckers problem is the ‘citizens’ know exactly what he & his fellow EU fanatics want to do & they reject it. It seems Turks understands wants going on far more than Juncker & schulz ever will. And also too many Leaks, mainly LuxLeaks. In democracy it’s absolutely normal that people disagree with each other, it’s normal that various people have various opinions and it’s absolutely normal that sometimes consensus isn’t reached. Mr. Juncker, If you don’t like these fundamental pillars of democracy leave ASAP (as you were told/asked numerous times on many occasions) and let other diplomat with basic knowledge of democratic principles to do his/her job. The EU has way too many highly paid bureaucrats. Al the individuals are mniac social justice warriors who care not one iota for those at the bottom of the pile who are forced to compete with new arrivals. Η ΕΕ έχει τον τρόπο πάρα πολλά υψηλόμισθους γραφειοκράτες. Al τα άτομα είναι mniac πολεμιστές της κοινωνικής δικαιοσύνης που δεν ενδιαφέρονται ούτε στο ελάχιστο για εκείνους που βρίσκονται στο κάτω μέρος του σωρού που αναγκάζονται να ανταγωνιστούν με νέες αφίξεις. L’UE ha troppi burocrati ben pagati. Al individui sono mniac guerrieri di giustizia sociale che non si prendono cura di una virgola per quelli in fondo alla pila che sono costretti a competere con i nuovi arrivati.